Hundreds of students have completed paid internships through Oxy’s InternLA Summer Internship program. Every summer, 30-40 students gain valuable work experience with a variety of organizations throughout the Los Angeles area. 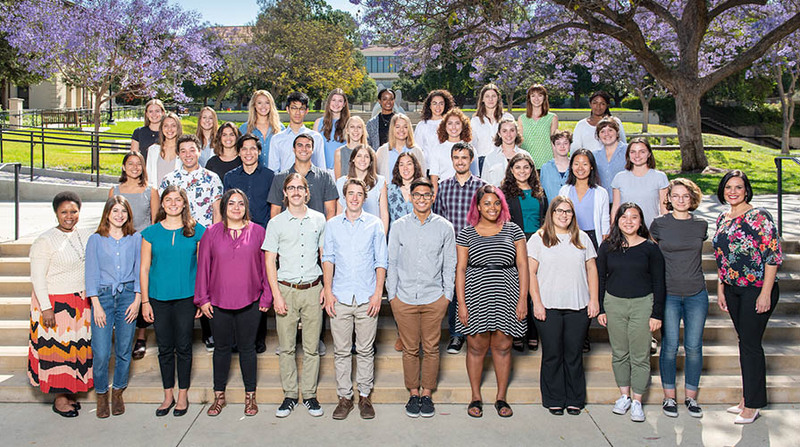 InternLA is a highly successful paid internship program designed to encourage talented Oxy students to gain real-world work experience over the summer. Oxy students who meet the eligibility requirements may apply to two internship opportunities. Participating employers throughout Los Angeles interview and hire Oxy students for one full-time (40 hours/week) internship for ten weeks, commencing in early June and ending in early August. Read about a few of our Summer 2018 participants, pictured above. InternLA participants have completed summer internships with numerous employers throughout the Los Angeles area. Some of the organizations and companies that have employed InternLA participants include: Center Theatre Group; City of Hope; Community Partners; Dine Equity; Los Angeles Zoo; Office of the Mayor of Los Angeles; and the Grammy Museum. To enhance the career and professional development of Oxy students, students who obtain a summer internship through the InternLA program are required to participate in IMPACT. IMPACT is a weekly, on-campus career and professional development training program for InternLA participants. Through IMPACT students learn about the career development process; participate in networking events; tour employer sites; and make a TED Talk style presentation to their internship supervisors, faculty, and administrators at the end of the summer internship program. As part of the InternLA program, two Oxy students are awarded the Richard C. Cornuelle Fellowship in honor of Oxy alumnus, Richard Cornuelle ‘48. Students selected as Cornuelle Fellows complete their summer internship with Community Partners and receive funding for on-campus room and board. Click here for more details about the InternLA program, eligibility requirements, and program schedule. Congratulations to the InternLA Summer 2018 Cornuelle Fellows, Manjun Hao '19 and Anna Holm '19! See more Student Spotlights on our Instagram page.